Japanese Episode AG 092: "Ano San-biki Toujou! Shinpan Gakkou no Shima!" American Episode 364: "Judgment Day!" As our heroes rush to meet the ferry to Tokusane City, home of Satoshi's next gym battle, they get on the wrong boat and end up in Banba Island! The gang has to wait an entire day for the next ferry to Tokusane City, so they decide to hang around the island's referee school. There, a young student named Jimmy is training to be a top referee, so Satoshi and Takeshi decide to help him out. The two trainers have a battle with Jimmy as the referee, but the aspiring judge seems unable to determine when a pokemon is able to continue battling or not. Jimmy gets scolded by Sarina, his professor, and tells him that he needs to study more about pokemon types and characteristics before he can make a call a battle's results. Later that night, Satoshi and his friends spot Jimmy outside with his three pokemon - Fushigisou, Lizard, and Kameil. He tells our heroes how he caught his three pokemon and how he had wanted to be a great trainer, but he doubts his dreams will ever come true. Suddenly, the Rocket-Dan appear and kidnap Jimmy's pokemon! The three evolved pokemon fight against the mecha until Kameil, Jimmy's most experienced pokemon, evolves into Kamex and breaks out of its cage! The water pokemon is able to free the others and send the Rocket-Dan blasting off again. The next day, Jimmy tells our heroes that he's going to start a new pokemon journey as our heroes get on the ferry to Tokusane City. I'm surprised it took the anime this long to explore the world of pokemon refereeing, but I guess it's better late than never, huh? The first half of the episode was great, with Takeshi having Hasubrero "play dead" and Jimmy making the wrong call about the pokemon's ability to keep going. The second half, on the other hand, takes a huge dip in quality. We suddenly go from an interesting look at pokemon referees to a rehashed filler plot about a beginning trainer who has no confidence in his abilities, and the episode completely throws the refereeing storyline to the side. We already HAVE plenty of episodes about wannabe trainers. We don't need another one. The dubbed version introduces a new editing practice in Pokémon - digitally altering Japanese food. 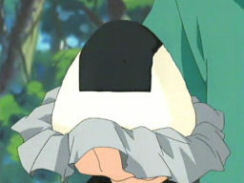 Previously, whenever onigiri would appear on-screen, the dubbers would simply call them donuts or sandwiches or rice balls or things like that without altering any of the visuals. Well, those days are over. Smile returns as the ending theme in the Japanese version after being replaced by Ippai Summer some time ago. Then, two seconds are cut from the episode's title screen. Also, in the Japanese version, the title screen changes from the Houen map to a shot of Satoshi's badge case and Haruka's ribbon case. The dub keeps the old map screen (reusing the title screen from "Lessons in Lilycove") for this one episode, presumably to make this one match the other episodes in the season. 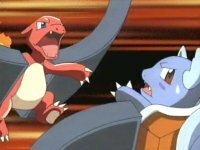 During Satoshi's battle against Takeshi, the fifth ending theme to the first series, Pocket Monsters series, Type Wild, plays in the background. It sounds pretty nice here, and it's a hell of a lot better than a certain overused song that begins with R and ends with eady Go!. The dubbed version replaces the Japanese vocal with instrumental background music, of course. And thus, a new trend in editing reaches Pocket Monsters: changing Japanese food into more Western food. They've done it with One Piece and Tokyo Mew Mew, and now it looks like they're doing it with Pocket Monsters as well. The problem I have with the edit is that it's tacky no matter how you look at it. Artistically, it looks like crap. The drawing itself looks fine (even if the colors are a little bright), but 4Kids doesn't actually animate it at all. They just use that one static drawing of the sandwich and adjust its size and rotate it to fit the shot, and the result is something that looks like it was animated by the Aqua Teen Hunger Force guys even though Pokémon doesn't have the excuse of being so low-budget. Logically, the edit doesn't make sense either. 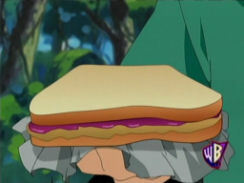 We're to believe that a sandwich that big can fit in that little cloth in Jimmy's hand? And that it is then able to roll down a hill without falling apart at all? Sorry, I don't buy it. I guess 4Kids is trying to make the show more "Western-friendly," but I wonder how a ball of rice that's on-screen for only a few seconds is "Western-unfriendly." Surely the company doesn't think kids will change the channel in disgust if they see a food item they've seen in the show countless times before, right? It's not really an edit worth freaking out over, but it's still stupid and disappointing. Two seconds are then cut from the episode's TO BE CONTINUED... screen.